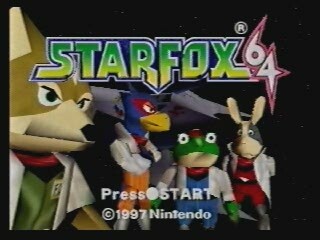 Released in July 1997, StarFox 64 is essentially a remake of StarFox for the SNES. Like before, Fox and his trusted wingmen must stop the evil forces of Andross from conquering the Lylat System. Note: The 100 percent run is considered single-segment because the run was done in one sitting, and the game forces you to reset twice. Best time: Single-segment 0:22:45 by 'Hayate1129' on 2015-09-06. Best redline route time: 0:35:35 by Brett 'Psonar' Ables on 2006-09-27. Best 100% Expert-mode time: Single-segment 1:18:51 by Zack 'Zallard1' Allard on 2015-04-30. Best European version Expert-mode time: 0:33:16 by Aleks 'SuperCoolAl' Lukic on 2005-07-02. Redline route expert mode 0:35:35 by Brett Ables. Thank you Nate for your unparalled prowess at being...Nate. Thank you Radix for all that you do to make SDA awesome! Thanks also to Mike Uyama and DJGrenola -- SDA's cup overflows. Big thanks to InsipidMuckyWater who enthusiastically supported my Star Fox 64 speedrunning efforts. Thanks are due to Sir VG, StrangenessDSS, and SuperCoolAl for their activity in the Redline discussion topic where this all got started. Thanks to TSA for speedrunning the game first. He's the "Hylian who saved Lylat." The Redline Run Forum Topic was in fact the first Star Fox speedrun forum I found. Seeing the competition going on with the redline run and the discussion about further Star Fox 64 categories gave me the idea for my 100% run. That was where I made my first post. After being well into my 100% run a while later I went back and did a redline run for fun. In the end, my final 100% run contained a redline portion that was 35:43 with earning all the medals and it being Expert Mode. For the Redline category to make sense I figured the run submitted for it would need to be significantly faster than the redline portion of the 100% run, so I went to work. After a few days of repeated attempts I finally nailed this very snazzy 35:35 in Expert Mode. The "redline route" is CO-SY-AQ-ZO-SZ-A6-VE, which is designated by the game as the hardest route with red paths connecting those levels. This route shares almost nothing in common with the any% route. Doing the redline route in Expert Mode is the greatest possible "Pure Speed" achievement in a single playthrough. Informal competition has confirmed the difficulty of this route compared to the any% route. I couldn't have asked for a better opening to the run. Other than getting hit a few times, everything down to the barrel rolling was right on. The main difficulty here is in boosting through the arches and making it through the final hoard of enemies without any collisions. I managed both very smoothly, setting me up nicely for the boss fight. The Attack Carrier, a blast from the SNES past, is my favorite boss to take down in the whole game. You'll see me cap off the first level with much gusto as the Carrier succoumbs to my rapid tapping. This level is always tricky, but went very well overall. I use some interesting bombing to take out enemies that pose a collision risk from behind. Other than that I actually have to take down more enemies here because I need the 100 points required to proceed to Aquas. Obviously I got the 100 points, but I bet you weren't expecting such a close call... The boss fight is really the meat of the level because of it's annoying randomness. In this run I lose about 15 seconds chasing the boss down. A more patient player could luck-manipulate this boss into a much quicker death, but I just ate the lost time and called on my luck later in the run. How a Fox ended up in a submarine to destroy a bio-clam-weapon beats me, but I bet Fox would want to get this level over with quickly. I do just that by holding boost the whole way as I take out whatever enemies pose a threat. The exploding starfish were my biggest concern. Other than that I barrel roll like crazy to avoid damage and meander my way through the enemies. The boss went entirely well except that I wasted a cycle of eye vulnerability because my torpedoes wouldn't lock onto the eye when I needed them to. I lost the few seconds I gained from doing the level effeciently. This is a pivotal level in the run, because 1 missed searchlight means an immediate restart. The searchlights aren't so bad until you hold down the boost button and tend to whip right past them. Also being in Expert Mode makes the level even more brutal because there are so many random opportunities for collisions. Aside from a few close calls with both collisions and searchlights, everything went swimmingly. The boss here is very systematic, and I manage to keep my bombs fully stocked by collecting the bombs he gives out. I took the pirate down with no contest, careful to avoid collision with the ball and chain or any of the cannonballs. This level has some fairly simplistic objectives: destroy the missiles, don't collide with the missiles, don't do much else for fear of causing lag. I actually play a risky game with myself of seeing how far away from the missiles I can be when they first arrive and still make it there in time to destroy them as they come onscreen. If the missile gets destroyed before ROB64 finishes saying "Distance 50" then I consider it a success. At most I lost maybe 3 seconds from not destroying them sooner. Wingmates could possibly be used to help destroy them faster, but the lag created in dogfighting could be more loss than the gain of a wingmate putting a few more measly shots in. I'm very satisfied with the level overall. Running this level without killing everything is a serious act of will power! I basically just boost through the level taking out any enemies that pose a threat to my precious hyper lasers. Between that and dodging lasers I had my hands full most of the time anyways. I use a bomb to take out some of the butterflies before the checkpoint. Mad barrel rolling saves my hide on numerous occasions. The boss did not go nearly as well as I'd hoped. I was hoping to mimick what I did in my 100% run, but I ended up doing worse than "normal" in the process. I tried to get all 3 tenticles in one appearance, but not only does that never occur, it took me 3 seperate appearances of the boss to get the second set of tenticles. This was another avoidable time loss for sure. Luckely my mistakes never cost me my lasers giving me the change to redeem myself on Venom! Redeem myself is exactly what I did! While I didn't get good opening shots on the Star Wolf team, I dropped them like flies with some dogfighting skills. I then take the speediest route to Andross and wreak havok on his face. My finger got a bit sticky when shooting the hands, but I still took them both out in one go. I then proceed to own the brain in the best kind of way, you'll just have to see it yourself! After that, depending on your sense of humor, drama, or irony you may or may not like my exit sequence! I assure that all mistakes in the exit were unintented, which to me actually makes the exit sequence a pretty awesome ending to the run. For additional comments on the run, the forum topic Star Fox 64 "Red Line" seems to be the most appropriate place. I can be PMed at SDA or contacted through any links in my SDA profile. At Gamespot and elsewhere I am flutefreak7. I'm likely done with speedrunning this game because I need to focus on other things. Any challengers have their work cut out and are welcome to replace me, just remember to check your G-diffusor system and do a barrel roll! This run is the property of the runner, Brett Ables. If the run is posted anywhere online, or made available for viewing by any means other than personal viewing through download from SDA, please include my name and speeddemosarchive.com or a link to this comments page. I gladly allow the use of this run for DVDs, music videos, etc. with the intent of supporting SDA so long as proper credit is given as previously mentioned. Sincere thanks to all who watched the run and/or read the comments! A final thanks to Miyamoto for creating my favorite game. Single-segment, 100% Expert Mode 1:18:51 by Zack Allard. I'd like to thank a few people before I start talking about this run. -The many SF64 runners that were active when I sporadically ran this game. This includes, Pottoww, FireHawkRise, DsxChallenger, Stivitybobo, ScottJProgan, and possibly others that I may have forgotten to mention. Everyone here had some sort of contribution to the various speedruns that SF64 has to offer, including improving/testing strategies, providing competition, and of course general support. -The SF64 high scoring community. This includes a ton of people, so for anyone I forget, I apologize. Have to thank Dimitrij Jarowoj, Winifried Merdes, Manfred Rieder, Steven Brown, Trevor Norgaard (even though you caused some hectic things), Thomas Potter, Allan Victor and CaioNintendo2. I know score attacks have extremely limited activity these days, but I absolutely had to give a mention to these folks, since I learned many of the subtleties of the scoring system from many of these players. They have a limited role in a run like this, but I tried to apply many of the discoveries to stages as often as I could. -Psonar for coming up with this category in the first place in 2006. As some backstory, when I initially started getting into highscoring this game, Psonar was starting to wind down from it. As his last hurrah, he completed 3 really top notch speedruns of this game for the time: a massive any% improvement, a redline run in expert mode, and this category, 100%. Of the 3 categories, Psonars favorite was 100% because of the incredible difficulty of completing the run while exemplifying high scoring skills. This category really tests how well you know the game in-depth, because of how long it is. It also has an interesting history with SDA just for the odd fact that it was the first RTA run that SDA ever accepted and published, despite RTA runs not being greenlit for publication until far later. 1) Try to get as many difficult, random and/or reset heavy stages as I possibly can earlier in the route. 2) Make sure my bomb count is sufficiently high for each all-range mode stage that could benefit time-wise from them. 3) Do not have Fortuna and Bolse in the same loop, or else Star Wolf doesn't show up in Bolse for extra fast points. 5) Make sure Venom II is the final stage, because the game saves the medal "after" the ending cutscene. This gets Katina out of the way first, since it is far and away the most difficult and random stage to achieve the medal on fast, not to mention it is the easiest stage to lose a wing on in expert mode. Sector X can be a little rough with the gates at times, so I felt it was best to get that out of the way too, since by comparison Solar is far easier to succeed on in my opinion. Titania follows from Sector X because the only way to get to Titania in the game is from Sector X. Loop 2 is pretty much full of important & difficult stages outside of Corneria. Bolse is the most important of the stages in the loop as far as time goes, but it isn't as bad as Katina, so this is pretty much the sole reason it's in loop 2. It also benefits from the extra bombs that you naturally end up with after playing through Zoness. You do not get the same luxury after Titania and Sector X, since you end up using all bombs in Katina, otherwise Bolse would be in loop 1. Loop 3 is just finishing off the rest of the stages. In my opinion, the only really important stages in loop 3 are Fortuna, Area 6, and Venom II. I would have Fortuna earlier in the route, but compared to Katina and Bolse, it basically had to get shoved in loop 3. Also I just want to point this out since it's pretty wild to think about... a speedrun category of Star Fox 64 on SDA is geting a 6+ minute improvement with this submission. SIX entire minutes saved in a STARFOX game... it's pretty crazy how far speedrunning has come in the past decade, hahaha. Corneria 1 - Pretty standard stuff. Quick boss fight, so I'm happy with it. You also get to see that I'm "half boosting" which is actually slightly more effective in moving your ship forward than just holding boost down. The cooldown of your boost is reduced with half boosts, so there's just slightly more boosting throughout each stage. Meteo 1 - Also pretty standard stage. This is probably the easiest medal in the game to get outside of Fortuna. Ended the stage with 9 bombs for Katina. Katina - This stage is complete chaos. Enemies will fly all over the place and can easily crash into your ship from behind and crush your wing off, leaving you with no lasers. I don't know what was with the somersault, don't ask. It's a byproduct of trying to break & having the ship try to move up. I got some pretty good grouping with bombs in this stage, but I lost a wing to an enemy near the end. It wasn't enough to reset since I did most of the damage already with my lasers, so I just winged it. Launched a bomb at the core when it showed up, but in hopes to reduce lag, I looked away from the explosion. Unfortunately, the bomb didn't kill the core for whatever reason, so I had to turn around and finish it off. I still saved quite a bit of time in this stage compared to the last successful run I had, so I kept going. Sector X - I lost my wings twice in this stage, hahaha. For the first loss, it thankfully came before the wing repair and 2 laser upgrades, so I was able to recover lasers before it really mattered. Corneria 2 - Nothing terribly interesting here. I hesitate slightly on the last arch because I really cannot lose a wing here. You also start to see me use cockpit view here when I look away from the center of the screen, which does reduce lag in various spots in the game. Cockpit mode in general is slightly laggier than non cockpit mode, but it does have its uses. Rule of thumb is, if the environment is noticeably laggier than if it would be in cockpit mode, you should go into cockpit mode. Basically, choose the lesser of two evils. I look away from the boss to reduce lag whenever possible. Sector Y - A standard stage, but I missed the quick kill on the boss, which was pretty unfortunate. I detonated my bomb a little too early, so he didn't receive maximum damage. Had to chase him around a little bit, which also cost me my wings. Thankfully Aquas is next, which makes recovering lasers without losing time possible. Aquas - I get some bonus points with the torpedoes as a shoutout to the highscoring community. It also makes getting the medal easier and it doesn't cost lag frames, so I figured why not. The boss fight was pretty good since I never lost a cycle on his eye phase. The last torpedo could have been slightly faster, but the pearls didn't completely cooperate. It's ultimately a very minor gripe in an otherwise great stage. Zoness - A standard stage, nothing too noteworthy. The boss was rather poor because I missed my first bomb on the exhaust pipes, then missed ANOTHER bomb on the final part of the boss that needed to be broken off. The hit detection on this boss can be a little spotty sometimes because the bomb actually has to physically connect to receive any damage at all; the explosion itself deals none. Sector Z - Something that may not have been apparent until now is that when your ship is in "All Range Mode" with its wings fully out, quarter boosting is preferred over half boosting in terms of covering distance fast. This stage went decently well, although I lost a few seconds ultimately since my position on the final volley of missiles was not perfectly ideal like my last run. I got a pretty sweet score for this stage at least. Bolse - This stage is a doozy, so I apologize in advance for the wall of text following this sentence that's bombarding your screen at the moment. So, from my previous comments, you would think this run was kind of doing poorly, and with that observation, you wouldn't be too far off. However, this stage completely changed the tune of this run. Outside of Katina, this is probably the most significant stage for a speedrun of 100%. I need to get a medal for this stage since it's a 100% run, which means getting 150 hits before all 8 cores are destroyed. I end the initial segment of this stage with 24 hits after destroying all 6 energy towers. I position myself to where I will be in front of a ground turret after the cutscene finishes. This is important because after the cutscene, there are 2 things that trigger the final 2 events in the stage, and both of them rely on how fast you get points. Getting 5 points after the cutscene (29 total for me), triggers the Star Wolf team to appear so long as they haven't already been killed in Fortuna already in the current loop. Getting 10 points after the cutscene (34 total for me), triggers the core in the middle to appear. The core has 8 flashing panels, all of which are worth 11 points each (HIT+10), totaling at 88 hits given all 8 are destroyed fast. The game plan here is to trigger the Star Wolf fight to start immediately, so since I start right in front of a turret, I used a charged unlocked shot (CUS) to double the value of the turret to 2 hits instead of 1. Next, I fly to the base of the next tower which has 2 ground turrets. I fire another CUS at one turret while firing lasers at the other, gaining me 2 points for the successful CUS, and 1 for the turret gunned down with laserfire, totalling at the 5 points I need for the Star Wolf phase to begin. I get into a spot to where I can start bombing as many of them as possible before they break formation when they reach the center of the stage. Unfortunately, only one of them died on arrival, however, the rest were severely weakened to where it takes very little effort to kill them. Since I start the phase with 29 hits and the core is worth 88, I need a score of 62 before I start taking out the core. It is preferable to take out 3 SW members, but it's possible to get to the medal score with 2 of them down if you get enough random ships in the mix. Thankfully, Andrew flew in front of me after the bomb volley, so that lightened the burden pretty quickly. I noticed I had 62/63 hits when I decided to do a U-Turn, so I knew the time was right to take out the core. I took a risk by not bombing the core a 2nd time after the bomb during the turn just for the sake of lag reduction, but it paid off because I landed a successful 1 cycle Bolse core, which is really difficult and inconsistent to pull off. This was the fastest I had ever completed the stage with the medal, and considering how important this stage is for a speedrun of this category, this a run really worth finishing at all costs. Corneria 3 - Very standard stage with nothing worth mentioning compared to Corneria 1. Meteo 2 - Also nothing noteworthy here compared to Meteo 1. Fortuna - I use an opening similar to the score run of this stage that involves CUS'ing the center of the base, which scores me an easy 5 hits off the bat. Similar to Bolse, I need a certain score because each Star Wolf member is worth 11 points each (HIT+10), so 44 total. I turn around and kill one of the ships that get past me for the 6th enemy I need to reach the medal of 50 hits given I kill every Star Wolf ship. I use a glitch that Psonar found, which he coined the "Sky High" glitch. Basically, consecutive U-Turns will constantly give your ship more height. Your ship constantly drifts downward, but you still end up with a net gain of a tiny bit of height each turn. Naturally, this takes a while to set up, but thankfully since the 6 enemies are taken out so fast, you have plenty of time to gain enough height to get the drop on Star Wolf at the exact location they spawn. Unfortunately, I miss the very first bomb, which puts me at an immediate disadvantage. It's a blind shot for that first one given my height, so it's not a completely misunderstandable mistake, but it still saddens me that I could not completely replicate how great this fight can be with the height advantage. I did my best to recover, but this is perhaps the stage I am the least happy about in this run. However, considering the massive success of Bolse, I kept going. Solar - Lag management is actually a pretty huge concern here. There are solar prominences (arches) throughout the stage that are comprised of multiple segments. If they reach the front of the camera, they will lag the game pretty hard, so it's best to either look away from them or use cockpit view whenever necessary. There are some tricky points that I get on occasion. You can get a point off of each lava wave if a charge hits the center of it. The same goes for if you shoot a charge at the center of "floor" of any solar prominence. Aside from that, the boss went pretty nicely. Good stage overall, only slip ups were lost due to lag in certain parts. Macbeth - I only need 99 hits here to get the medal considering the boss is HIT+50, so score isn't exactly a huge concern. Probably the most important time saver is to shoot the face panel off of the boss so it cannot use the multi-spear attack, since that causes some pretty significant slowdown. I couldn't break its claw off before it landed a shot on me at the very end, but it made for a stylish mid air shot to the final switcher. Area 6 - There are so many enemies here that getting the medal is pretty much a non-issue for me. The boss is where the important time savings are. At the start of phases 1 & 2 of the boss, you need to kill the energy balls, which is easy enough when you consider the boss is not considered a solid object until it opens, meaning a well timed bomb will take all of them out at once. The important part of this fight however, are the tentacles. Once you kill one tentacle, then a really short timer starts that tells the boss to teleport to the background and start swatting you with them. The goal for a speedrun is to kill all 3 tentacles before the boss even gets an opportunity to teleport away from you. Thankfully I get both of them, making this a really strong Area 6 stage. Venom II - At the end of a run like this, this stage is a really nerve wracking one due to the extremely easy possibility that your wings could be taken from you, which makes you bleed time in the Star Wolf fight, as well as Andross. I had exactly two things in mind for this stage: Kill Wolf's ship 1st no matter what, and DO NOT RISK LOSING A WING. Thankfully, Wolf cooperated enough for him to die before he escaped my sights. That kind of set the tone for me to play the rest of the stage very, very safe. I picked off each of them one by one since I had no disruptions since no one could chase me. It did end up costing me a good chunk of time against Andrew, but I feel it was an understandable safety to take given how fickle this stage is at the end of a run this long. I got to keep my lasers, which meant Andross got wrecked. He tried to drift away from my bomb at the start of the brain phase, which I totally caught onto and adjusted all my following shots perfectly, wasting zero time for his highly unusual pattern. The escape was fine. I did smack a wall on the way out, but hey, at least it was after the boss fight! A pretty solid end to this run all things considered. European version expert-mode 0:33:16 by Aleks Lukic. Expert difficulty in this game basically means there are more enemies, and they shoot more rapidly and with faster lasers. It also means if you collide with ANYTHING you lose a wing, and therefore any laser upgrades you may have accrued. Collisions also incur much more damage. Much effort is therefore taken to avoid collisions! Corneria- Manage to get a medal, and kill the boss without having to U-turn. Meteo- Use up some bombs at the start to avoid boosting into some enemies that pop up from behind the rocks. Very satisfied with the boss fight. Fortuna- Was a bit worried when I lost a wing, but then I remembered that the 15th enemy killed on an all-range mission gives out a laser upgrade/wing repair. ROB saves the day! One of my fastest clearances of the Wolf team ever. Sector X- Let Peppy die so he wouldn't distract enemies from Falco in the next mission. Some pretty shoddy flying in the warp. Sector Z- The most important time-saver. Letting the first missile hit the Great Fox ends the mission two minutes faster than if you were to save it. I kill Slippy so the enemies focus on Falco so he doesn't go after the missile. Bolse- I lose my wings and spend a bit too much time looking for an upgrade and give up in the end. Not much time wasted though, just a second or two after each attack run on the core. My heart skipped a beat when I collected the last gold ring (I was hoping to start Venom with two rings to allow a quick upgrade to double health). Venom 1- In places I am more conservative with boosting to avoid crashing and losing my wings and precious health. Interestingly enough on Expert mode Venom 1 is harder than Venom 2. VERY satisfied with how quickly I manage to take out the statue boss and Andross. Hope you enjoy watching it! Since I discovered this project a few months ago I have been mighty impressed by the work here, and it is an honour for me that I have a run hosted here. Thanks to Nate for capturing and Radix for upkeep of the site.